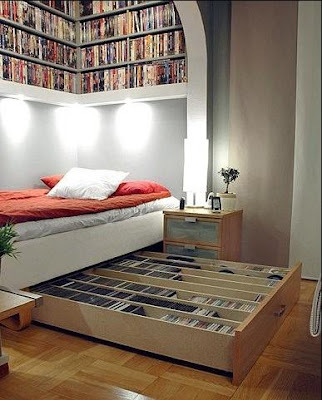 Alright-to finish up my book shelf organization post I'm going to share these great ideas (which aren't mine) with you. My husband really wants this reading area for his own. I love the storage under the bed, the great lighting, and the surround book shelves (I also love that the book shelves are out of the reach of little hands). See more here. 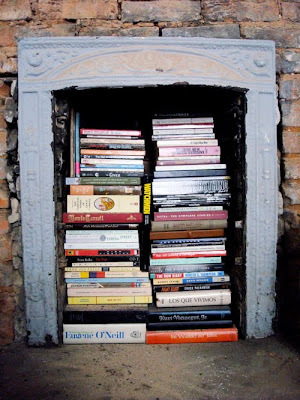 I thought that these were a couple of great ideas for additional storage of books. 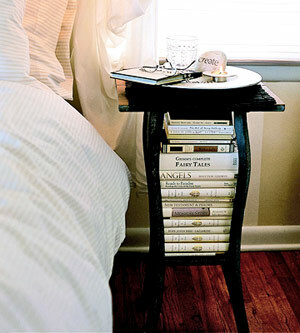 The end table seems like a really practical way to use the space that is often wasted. I am not convinced that the books would be easy to get to though. You can find more great ideas on this topic at Decorating Ideas. This Fireplace was converted into storage area for books...she also used her books to keep her pets out of the fireplace (two purposes served). See My Happy Home for her original post. I am really loving these Self shelves. Isn't it a fun way to display your books...just turn your books into a shelf themselves. I found the original post here at femtalks blog. The shelves are from dutchbydesign. 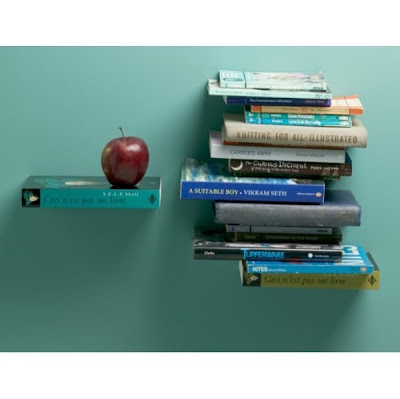 I am not convinced that these books are removable...they may be permanently attached, but I really want to try it. Doesn't it look fun. I found the image on this library's website. Unfortunately I couldn't find any other info about the shelf. This last idea is possibly my favorite of all. 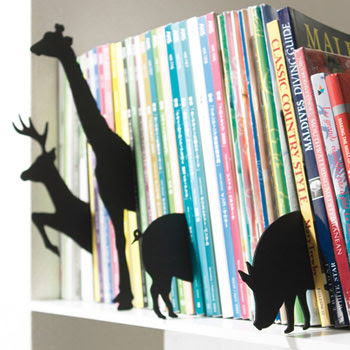 Look at these great book markers-you know mark the placement of a book on the shelf (not your place in the book). They would be so cute on a child's book shelf. I really want these. I just need to find them. The only link I could find to a store was not in English...and there was no way that I was reading it-you can give it a shot though (here). The original post can be found at Apartment Therapy. 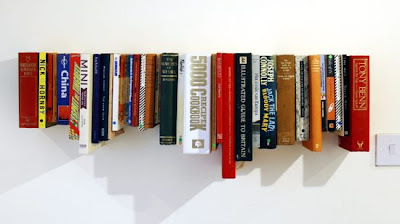 I hope that you are inspired to organize your books in a new way. I am sure feeling inspired.